Each place can feature 30 custom collections. Attention: If you don't see Save Collection when creating a collection, then you aren't a place owner and can't save collections, or you have reached the maximum number of collections. You can still share your collection Sharing collections. Create a new collection as described in Creating and editing image collections. Note: If you are unable to click Save Collection, then you have reached the maximum number of collections. If you want to save another collection, you need to delete one of the existing collections. Select Save changes to update the collection with your new one or select Save a new collection to make a new collection. 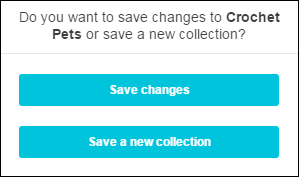 If you are saving a new collection, enter a name for your new collection and click Save Collection. Your new collection is displayed in the Collections library, after the other saved collections. You can change the order that collections are displayed, as described in Managing collections.